Disclosure: I was invited to the CHL press conference in Quebec City by Kia Canada. All opinions are my own. I was in attendance earlier this week at the Videotron Centre in Quebec City for the Canadian Hockey League’s (CHL) press conference. 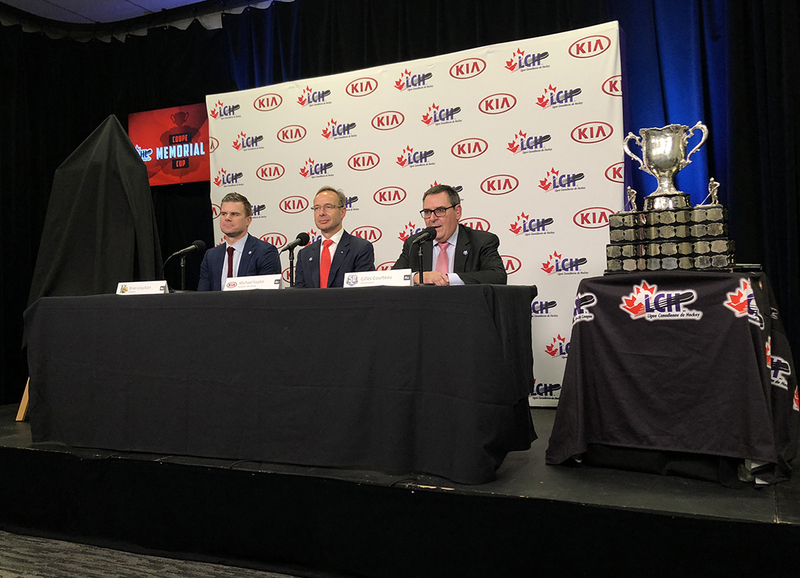 Kia Canada is announced as the Official Automotive Partner, for the next 5 years, of the Canadian Hockey League, Western Hockey League, Ontario Hockey League, Quebec Major Junior Hockey League, as well as new presenting sponsor of the Memorial Cup. The second special moment of the evening was the unveiling of the 2019 Memorial Cup Logo, with new partner Kia Canada’s logo incorporated into it. Unveiling the new logo were (from left to right): Brian Urquhart – President of the Halifax Mooseheads, Michael Kopke – Director of Marketing for Kia Canada Inc., and Gilles Courteau – President of the Quebec Major Junior Hockey League and Vice-President of the Canadian Hockey League. ”We look forward to the Memorial Cup presented by Kia in Halifax this May, and our 2020 event in Western Canada.” said CHL President David Branch. The third part of the press conference took us to Calgary, Alberta, where it was announced that the Kelowna Rockets had been selected to host the 2020 Memorial Cup, presented by Kia. The 2020 Memorial Cup will be held at Prospera Place in Kelowna, British Columbia from May 22 to 31, 2020. There were three Western Hockey League clubs that submitted applications to host the 102nd edition of the Canadian Hockey League national championship: the Kamloops Blazers, the Kelowna Rockets, and the Lethbridge Hurricanes. The decision to award the hosting of the 2020 Memorial Cup was made earlier in the day by a majority vote of the WHL Board of Governors. You can view the entire press conference below. Note: Press conference is in French and English, as it was held in Quebec City, a primarily French speaking province. It’s very exciting times in the Canadian Hockey League. I got to hang out with this guy as the Remparts De Quebec beat the Halifax Mooseheads 6-2 at the Videotron Centre last night! It was a great game, and both teams played so well. This is the future of hockey in Canada! Kia Canada Inc., a maker of quality vehicles for the young-at-heart is a subsidiary of Kia Motors Corporation (KMC) which was founded in 1999 and sells and services high quality, class leading vehicles like the Soul, Forte, Optima and Sorento through a network of 192 dealers nationwide. Kia Canada Inc. employs 154 people in its Mississauga, Ontario headquarters and three regional offices across Canada, including a state-of-the-art facility in Montreal. Kia’s brand slogan “The Power to Surprise” represents the company’s global commitment to surprise the world by providing exciting & inspiring experiences that go beyond expectations.